Professional credit risk analyst, 4+ years teaching experience. A full time senior credit analyst with multinational bank, CFA text synchronises well with what I do in my professional life on a daily basis. 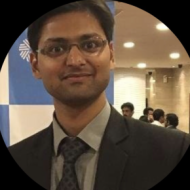 Shubham Goel describes himself as 4+ years teaching experience, also working as a credit risk senior analyst with multinational financial institution. He conducts classes in CFA Coaching, Class 11 Tuition and Class 12 Tuition. Shubham is located in Velacheri, Chennai. Shubham takes Regular Classes- at his Home. He has 4 years of teaching experience . Shubham has completed FRM from Global Association of Risk Professionals (GARP) in 2013, Bachelor of Commerce (B.Com.) from St. XavierÃ?Â¢? ?s College Kolkata in 2014 and CFA from CFA Institute in 2016. He is well versed in English and Hindi.